Many of us embraced rain gardens in the past several years for their ability to mitigate storm water runoff and to help cleanse groundwater of pollutants. 1. Problem: Lack of an underdrain. 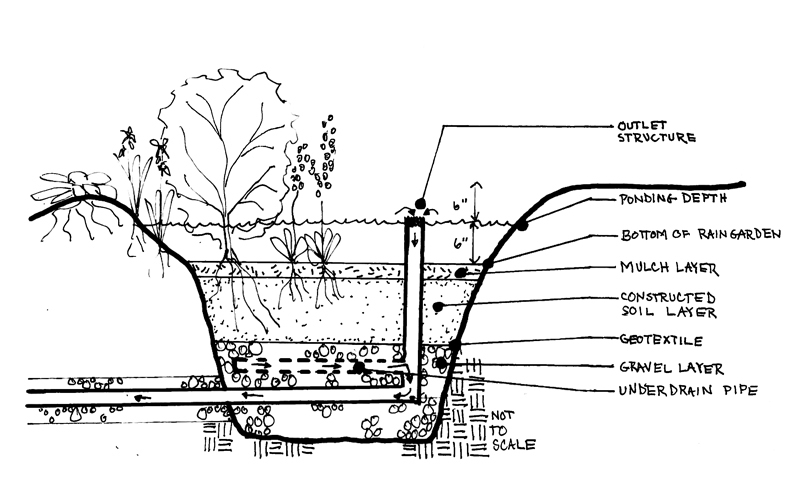 Rain gardens are designed to infiltrate storm water into the soil. But sometimes they fill up faster than they can drain. Solution: Install a 4’’ perforated pipe underdrain below the rain garden basin. This underdrain operates as a kind of relief valve if excess water accumulates in the rain garden. The underdrain is connected to an outlet structure, which is there to function during intense storm events when the basin fills up. 2. Problem: Clay and silt clog the perforations in the 4” underdrain pipe. Solution: If the rain garden stops draining, the underdrain pipe may be clogged. Flush the underdrain pipe with a garden hose via the outlet structure. 3. Problem: Sediment washes into the rain garden from surrounding surfaces, filling in all the desirable and needed air pockets in the mulch, preventing infiltration. Solution: Protect the rain garden from sedimentation with a silt fence or filter sock until the surrounding areas are stabilized with vegetation or paving. 4. Problem: Water won’t seep into the soil. Sometimes heavy construction vehicles compress subgrade soil to a degree that water cannot infiltrate. Solution: Loosen the subgrade before constructing the rain garden.